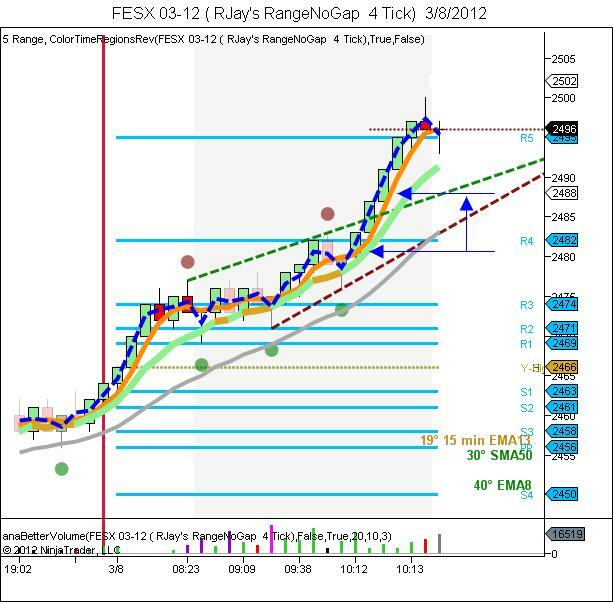 Althought last day FESX was trending up, new day is another history, and At the first hour of the day, i think its too soon to see where will go the market, so i think i should wait a little bit until some camarilla levels has been passed. 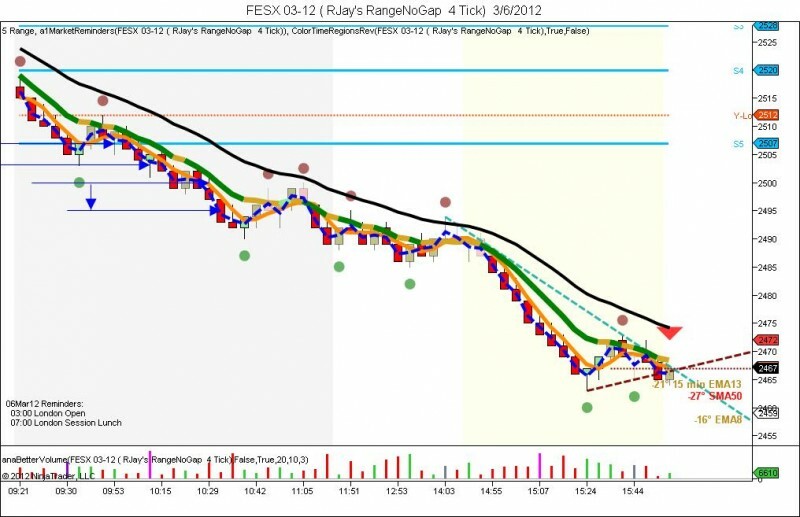 FESX and 6E was ranging this morning, so no trades should be taken. I entered long at 2524 about 8 AM, anyway it was too late, we have better probabilities when we enter at least in the middle of the candle. In addition i notice later that R1 camarilla levels was not passed. I should see camarilla pivots and see once we pass R4 we it should reach R5. Welcome to Mjose Journal, it will be a place where i will post my trading everyday with a new Manual trading strategy i am testing. To have a journal is something very recommended to register a log of all your trades and review it to analyze our errors and remember our best trades situation. Why FESX? To trade in real mode i am using a different platform and i need some time to open positions because i have to enter price number manually, this make very slow and i miss many trades, and for learning and testing purposes is the better i have found. Anyway sometimes i use 6E when market condition allow me to have the time to open position at the price. I use range charts with minute charts for confirmation. 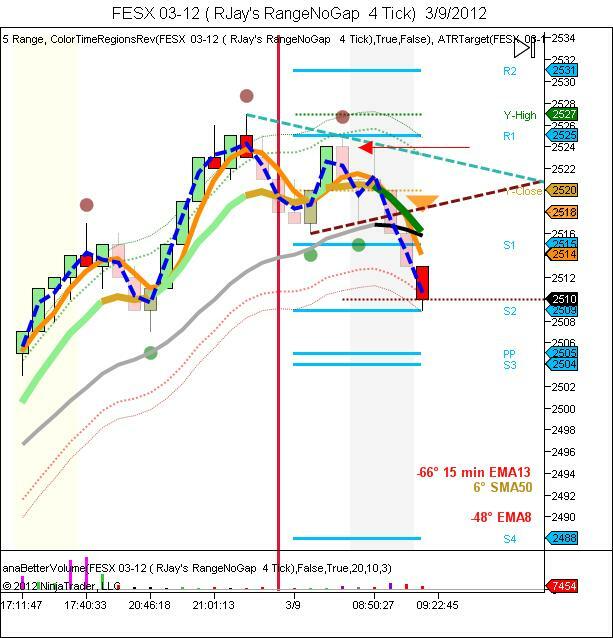 I use an scalping strategy that use 4-5 ticks of Stop Loss and 4 ticks to Take Profits, this could be changed depending of market conditions and news. Glossary of Stock market slang, we say enter long when we buy and enter short when we sell. You don't need to know what is going to happen next in order to make money. Porque los ricos son mas ricos en España y como se escaquean de pagar impuestos? The trader must have knowledge of the market to quantify his probabilities, dominate his game management, start at the right time and maximize your position. Your beliefs must be the execution of your probabilities, anything different will be betting. The fundamental problem is that crowd has been has been taught to do what is obvious and predictable, and to do it in concert. But, according to the laws of physics, the more people that use a certain methodology the less chance it has of success. The more people that game a future prediction, the greater impact their participation en masse, will void that prediction. It's the reason why truly effective systems and methodologies are proprietary and kept secret. "Can you imagine living a life without fear? One of the best antidotes for fear is love. Love conquers fear. When love is at the center of your life, it tends to flush out fear and give you the strength to climb any mountain, no matter how high. Why don't many people truly love? Most of the time, it's unfortunately because they are afraid." Did I follow my trading plan properly? Did I do anything wrong and if so, why? If I did follow my plan correctly but I lost money, I am not hard on myself. Sometimes this happens! If I didn’t follow my rules but still made money, however, that’s a problem. Was it lack of confidence in the system? If I bought or sold too soon, I want to find out why. or Non maintaining a trading journal. Disclaimer: All TRADING involves high risk and YOU can LOSE a substantial amount of money, no matter what method you use. Past performance is not necessarily indicative of future results.